Adrian Martinez pulled off an incredible feat in his first season at Nebraska, something few who came before him had done at a place where football is a year-round passion. Martinez didn’t just live up to the hype that followed him from Fresno, California, to Lincoln as coach Scott Frost’s first recruit. He exceeded it. He was the first true freshman quarterback to start a season opener for the Cornhuskers, and he became the most productive rookie in program history. How much is expected of him this fall? Here’s one indicator: The Westgate Las Vegas SuperBook last month listed him behind only Alabama’s Tua Tagovailoa and Clemson’s Trevor Lawrence on its initial Heisman Trophy odds board. Martinez, along with Oklahoma’s Jalen Hurts and Ohio State’s Justin Fields, is plus-600, meaning a $100 bet would pay $600. Tagovailoa is plus-250 and Lawrence is plus-300. “It’s humbling,” Martinez said. “Obviously, it’s an award that you grow up knowing about. At the end of the day, that is not my primary focus. My primary focus is getting better each day and helping this team win more games. That’s what matters. Everything else will take care of itself.” The Huskers, who played their spring game in front of 85,946 fans Saturday, are projected to be one of the most improved teams in the nation after going 4-8 in Frost’s first season. They started 0-6 and then won four of their last six. The last two losses were by five points at Ohio State and by three at Iowa on a last-second field goal. 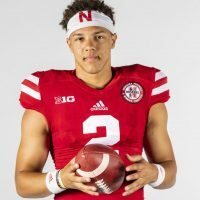 Martinez played through the requisite bumps for a freshman to lead the Huskers’ offense to its highest national ranking since 2008. He set single-season school records for games with 400 yards of total offense (three) and total offense per game (295.1 yards). That’s in addition to school freshman records for passing accuracy (64.6, passing yards (2,617), passing touchdowns (17) and total touchdowns (25).